The Pont de l'Alma is a continuous, two span box girder bridge with the girders haunched at the pier to resist the large moment. It is actually two parallel bridges that are connected by a walkway on the deck. Most of the other Seine River crossings are arch bridges, but the Pont d'Alma is a similarly unobtrusive structure that was built to enhance rather than obscure views of the surrounding city. The current Pont d'Alma was completed in 1974 to replace a narrow bridge of the same name that was slowly settling due to scouring of the foundations. The replacement structure was built with a 40 meter deep foundation at the central pier and with piles supporting the abutments. The previous bridge was commissioned by Napoleon to commemorate a victory over Russia in the Crimea. It was a three span stone masonry deck arch bridge with statues of soldiers from different regiments at each pier. The statue of a Zoave (North African) soldier, was taken from the original bridge and placed upstream at the central pier of the new bridge. The Pont d'Alma has a long (110 m) span that crosses most of the river and a short (31.5 m) span near the Right Bank. It is 42 meters wide, carrying four lanes of traffic in each direction along with walkways on the two sides and at the center. Considerable effort was made to preserve the Pont des Invalides (just upstream) while the Pont d'Alma (similar in structure, ornamentation, age, historical significance, etc.) was quickly replaced when it was found to be deficient. 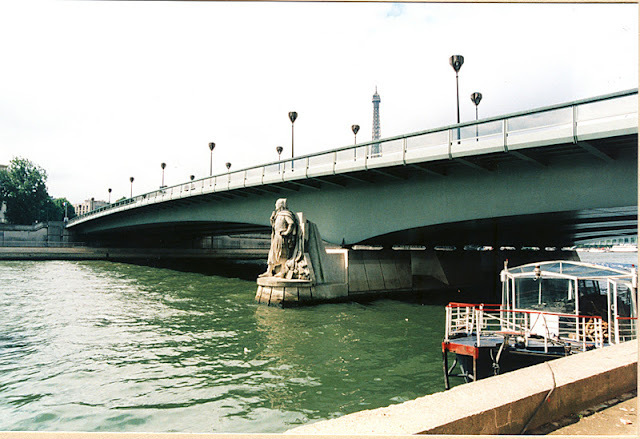 Perhaps this was because the Pont des Invalides was repaired in the 19th century and widened in the 20th century. The Pont d'Alma required both at the same time. Seine River Bridges: Pont de l'Alma by Mark Yashinsky is licensed under a Creative Commons Attribution-NonCommercial-ShareAlike 3.0 United States License.